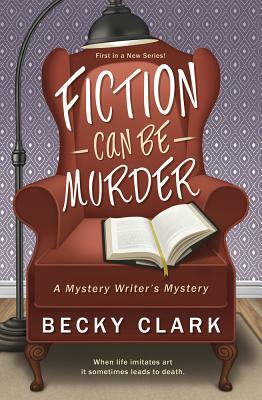 Mystery author Charlemagne "Charlee" Russo thinks the twisty plots and peculiar murders in her books are only the product of her imagination--until her agent is found dead exactly as described in Charlee's new, unpublished manuscript. Suspicion now swirls around her and her critique group, making her confidence drop as severely and unexpectedly as her royalty payments. The police care more about Charlee's feeble alibi and financial problems than they do her panicky claims of innocence. To clear her name and revive her career, she must figure out which of her friends is a murderer. Easier said than done, even for an author who's skilled at creating tidy endings for her mysteries. And as her sleuthing grows dangerous, Charlee's imagination starts working overtime. Is she being targeted, too? A highly functioning chocoholic, Becky Clark (Denver, CO) is the seventh of eight kids, which explains both her insatiable need for attention and her atrocious table manners. She likes to read funny books so it felt natural to write them, too. She published her first novel in 2001, and is a sought-after speaker.